History: Used to be in the Lok Kawi Wildlife Zoo before being transferred to BSBCC. Personality: After two years of living in the bear house, Wan-Wan has never stepped foot out of her indoor den into the forest even with numerous attempts (favourite food) from the staff. She prefers spending all day in her den and will only stick her head out to sniff the trees, but is not confident enough to move further out. 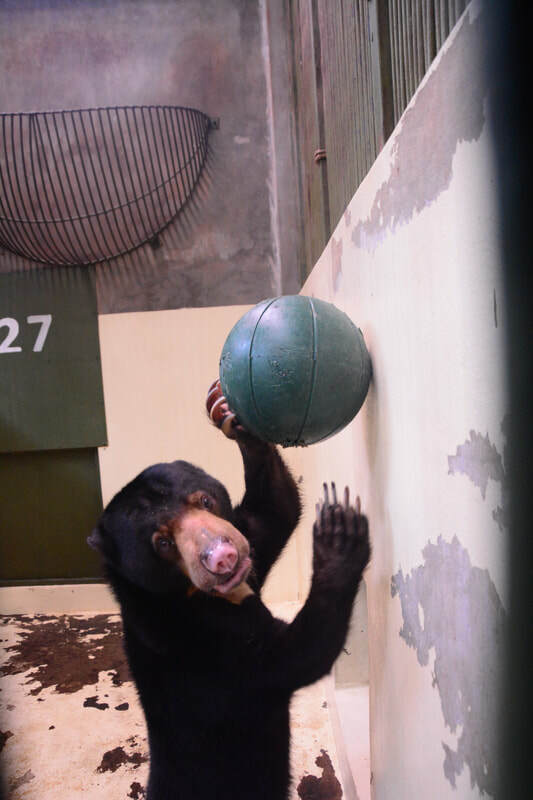 Wan-Wan is an aggressive and simple bear that keeps herself entertained throughout the day. She is always thrilled when it comes to enrichment. It is important for enrichment to encourage her to stimulate the natural behavior and gain back trust of the forest. She devours her treats! She also will find a perfect comfy basket for a noon sleep. We are hoping that Wan-Wan can overcome her trauma, find her confidence and join together with Mamatai exploring the forest one day. Wan Wan is available for MY BEAR adoption.